Tell me more about this produce box?! Is it through a local co-op? It looks amazing! Yea, it’s through a local co-op in our area. 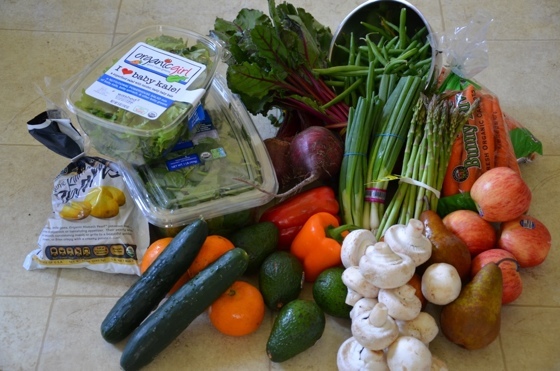 All organic – $70 worth of fruits and veggies for $50. To bad Liz isn’t here to eat the mushrooms! Maybe you can make some for me sometime … Maybe I just don’t know how to eat them. I can tell if someone uses cream of mushroom soup in a casserole – the tiny mushroom bits don’t fool me! our juicer arrives tomorrow! so excited. i want to find a produce delivery service in raleigh… we had spud (www.spud.ca) in vancouver but i would be happy with something from the NC farmer’s market here! Yea! I’m so glad you’re getting a juicer – we love ours! I don’t know of any co-ops in Raleigh, but if I hear of any I’ll let you know. That seems fitting since I hate mushrooms. See you next week! your website and in accession capital to assert that I acquire in fact enjoyed account your blog posts. I am satisfied to find a lot of useful information here within the publish, we’d like develop extra techniques on this regard, thanks for sharing. What’s up, after reading this amazing article i am too delighted to share my knowledge here with colleagues. this web page is in fact good and the people are in fact sharing pleasant thoughts. excellent put up, very informative. I ponder why the other experts of this sector don’t realize this. me. I am having a look forward to your subsequent submit, I’ll attempt to get the cling of it!